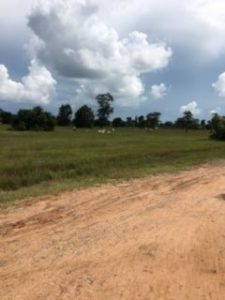 This past week, I traveled up to a small town called Samrong in Oder Meanchey Province, near the Thai border. To be honest, I was a bit nervous. I’ve been to remote places before to teach, and I really didn’t know what I would find. This has been a very busy and somewhat tiring trip, so I wasn’t sure quite how much of an adventure I was up for. 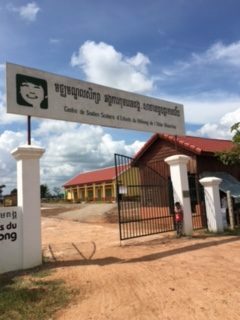 It was important, though, that I be the person to go teach there so that I could see the new centre recently built by our special Writing Through Partner, Enfants du Mekong. What a pleasant surprise this was. finishing my meal, the only customer in the restaurant, the heavens opened and the rains started. Huge, noisy sheets of rain. But what could I do? 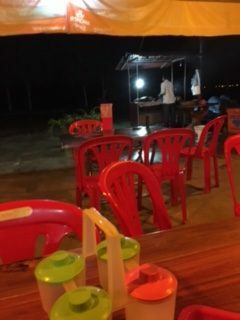 I sat, ate, stared at the rain alongside the chef and his wife who were now doing the same. Eventually, I paid my $2 (! ), opened up my umbrella which I had luckily/brilliantly brought along, and left. Now the grumpy chef and his wife smiled and waved, giggled a bit, and thanked me. I made my way back to the hotel in the rain. The darkness and the puddles lit only by moto headlamps racing by. It was only a five minute walk. But it was enough of an adventure for me –albeit a happy one. The next night, my ‘minder,’ Sopheap, took me to a restaurant and for the following nights, I ordered in from there. This was eating for nourishment, nothing more. But that was all I wanted after a day of teaching. Over five days, and with the help of Utong, the local English teacher, and Sopheap, I ushered 22 students into a new world of thinking and writing. These students’ English was rather limited, and what they did know they were afraid to say. But by the end of the week, they were each standing up in front of a school assembly and reading their poems and stories in English. The Writing Through methodology and its magic pencils worked its wonders again. The theme for this workshop was Change, and as I reflect on the week I realise that I saw many changes while I was up there, and happily, changes for the better. First of all, there were real highways leading from Siem Reap up north, wide, paved beautiful roads. And I actually stayed in a new hotel — with a big clean room, a hot shower, air conditioning, wifi. But more importantly, there was the new Enfants du Mekong centre, which was recently purpose built by donations from generous supporters: new classrooms, a new office and library building, new eating and living quarters for the students. And when asked to write their stories and poems about change, almost all of the students wrote personal peans to the importance of education and their love of study. This is the most important change of all. It must always be remembered that Cambodia is a country growing up with a parent generation of many uneducated, illiterate and therefore incredibly poor people. That ‘lost’ generation has no understanding of the importance of education. They were never able to see beyond their next meal, and so many of these children were born for one purpose only — to work to support their families. But the students understand the need to learn, and the need to invest the time, dedication and hard work that learning takes. Slowly, the population is growing to understand that for the country to progress, the children must be educated. As so often happens, the children are understanding that lesson before many of the adults do. But they are understanding it and taking it to heart, and that is the most important change of all. But for Writing Throughthere was another, very happy change. I mentioned Sopheap above. Well, his story is his own to tell, but I can say that it is a horrific one, with a childhood spent in fear, without education and without hope. He still struggles with family issues today. But, somehow he made it to Enfants du Mekong. Somehow he did get some education and ended up studying in Phnom Penh where he took part, two years ago, in a Writing Through workshop there led by our Facilitator, Lisa Edmondson, who he remembers with incredible fondness. Sopheap is our 1st Writing Through student turned Writing Through teacher, and so already the lessons of conceptual thought, self esteem and language fluency are expanding exponentially. I am a great believer in the possibility of change, but honestly, that was a wonderful change I never saw coming.